San Francisco - The rovers Opportunity and Spirit hit their one-year on Mars anniversary marks in November and December this year, traveling their respective patches of the red planet, while the Mars Express orbiter has kicked into high gear to give broader views some of the planet's icy surfaces. The two missions have come together in the past few weeks to produce a more complete view of Mars' water history that has implications for life on the planet, though pieces of that picture are still contentious. As reported at this week's annual meeting of the American Geophysical Union in San Francisco, the European Space Agency's Mars Express instruments continue to find more evidence for water ice. The satellite has been orbiting the red planet for 18 months, using radar and other tools to remotely observe the planet. So far, the High Resolution Stereo Camera (HRSC) has mapped more than half of Mars at 50-meter-per-pixel resolution, using a stereo camera that snaps blue-green-red and infrared imagery. 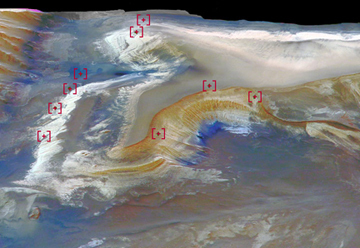 This 3-D perspective view from a camera aboard the European Space Agency's Mars Express orbiter, combined with mineral data (in false colors) from the satellite's OMEGA instrument, shows bright and brown deposits (red markers) that indicate that substantial quantities of liquid water must have been stably present in the early history of Mars. Image is courtesy of ESA/OMEGA/HRSC. The satellite looked into a buried crater, described last week in Science Express on Nov. 30, that seems to be filled to its smooth surface with "cold and very pure ice," according to Jeffrey Plaut, a research scientist from NASA Jet Propulsion Laboratory in Pasadena, Calif., who is a co-investigator on the satellite's Mars Advanced Radar for Subsurface and Ionospheric Sounding. Plaut said in a press conference on Monday that the deposits in the crater were "nearly transparent" to the radar instrument, an indication of the presence of such ice. This view from the panoramic camera on the Opportunity rover shows an outcrop called Olympia along the northwestern margin of Erebus crater. The outcrop exposes a broad expanse of sulfate-rich sedimentary rocks that formed predominantly from windblown sediments, but some also formed in environmental conditions that were damp or in shallow surface water. Image courtesy of NASA/JPL-Caltech/Cornell. Impacts and other catastrophic events such as volcanic flows could have melted such subterranean deposits, releasing water-ice into more obvious river-looking outflow deposits elsewhere, according to Plaut and other scientists working on data from Mars Express. The HRSC camera and OMEGA instrument have indicated various regions where two kinds of rocks that have water are located: sulfates and phyllosilicates (or clays). The two kinds of rocks indicate a possible shift between two climate "eras" on Mars, with two very different environments. "Mars 'fell' dry" around 3.5 billion years ago, said Gerhard Neukum of Free University in Berlin, principal investigator of HRSC, at the meeting. The early wet era was dominated by liquid water held in clays, and later, sulfates formed from evaporation processes in drier climates. As testament to the planet's wet days from before 3.5 billion years ago, Neukum presented stunning 3-D imagery of steep cliffsides that had ephemeral waterfalls running over their edges and swooping river-like landforms and ridges that could only have been made by volcanic activity and sudden meltwater floods that quickly evaporated, he said. 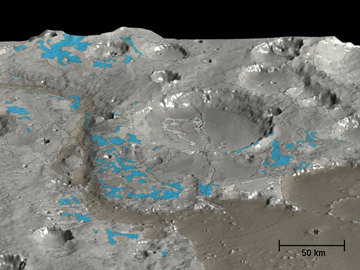 In this 3-D perspective view of the Marwth Vallis area (shades of grey), the OMEGA instrument aboard the Mars Express orbiter has mapped the water-rich minerals (blue). The instrument has not detected any hydrated minerals or sediments, either in the channel or in its opening. However, the outflow was so violent that it eroded and exposed ancient hydrated clay-rich minerals, suggesting that water was present in an early era. Image is courtesy of ESA/OMEGA/HRSC. Jean-Pierre Bibring, principal investigator of OMEGA and researcher at the Institute of Spatial Astrophysics at the University of Paris-South presented at the meeting imagery of exposed clays at sites more recently dug up by ephemeral flows or catastrophic flooding events. Such clay-rich regions potentially could have harbored life forms  and if they did, they may still hold evidence, he said. Meanwhile, on the ground, the Mars rovers have continued to explore new outcrops in what looks like empty desert, where they've discovered the sulfates from more recent drier days, evidence of evaporative settings. They've found "an astonishing, bewildering, delightful diversity of rocks," said Steve Squyres, principal investigator of the Mars Exploration Rovers mission and professor at Cornell University in Ithaca, N.Y., at the meeting. Spirit has examined nine rock types, including familiar wind-blown deposits and in-place bedrock that has been shattered and crunched by impacts, forming an interesting fractured pavement. John Grotzinger of Caltech in Pasadena reported halite, or sodium chloride, in small deposits, probably due to groundwater drying up. The Mars explorers team also reported that the rovers have had so much excess solar power that they have managed to stay up for several nights of moongazing in between daily excursions. A lunar eclipse of Mars' moon Phobos may provide the opportunity to observe the planet's atmospheric chemistry from spectra taken from Mars' shadows, the colors of which refract according to the molecules present. Both rovers have photographed Mars' night sky over several full-night exposures, snapping Orion's Belt and other stars, as well as capturing possible meteor streaks left over from the last pass of Halley's Comet. Jim Bell of Cornell University said that the robots could get about 30 nights of observations  all without rain, he joked  until their power starts to fade. The rovers are aging, and the team is treating each day as the last, said John Callas, deputy project manager for the rovers from the Jet Propulsion Lab. Still, although Opportunity may lose use of its sampling arm and Spirit's RAT grinding sampling tool is degrading, the research team remains confident that more work will continue come from the little explorers. Grotzinger noted that Mars Express findings are converging with those of the rovers, particularly when it comes to water on the planet. Still, he and other rover team members indicated that water remains an unsettled issue. Squyres said he is reminded of the parable of the blind men examining an elephant: "Mars is one damn complicated elephant," he said, with evidence both of evaporated fluids on the plains and of massive channels and valleys elsewhere that show liquid activity. For past coverage of dsicoveries and research on Mars, search the Geotimes site through our Archives.